Like all things in life, as soon as exercise becomes boring, we lose the motivation to do it. The key is to keep your body (and mind) on its toes by mixing up training styles and programmes to keep your workouts interesting, which will ensure you remain focused and on track to achieve your goals. Instead of getting stuck with the same routine and allowing your motivation levels to take a tumble, change one element every couple of weeks. Think of it like a recipe, adding a new ingredient each time you make the same meal to keep your taste buds interested! Or if you’d prefer to keep it the same, simply ensure it has enough flavour (variety) to start with. Not only will incorporating an assortment of training styles into your routine make it more fun and diverse (keeping you motivated), it will also improve your overall fitness as your body will be adapting to different movements and intensities while working different muscle groups. 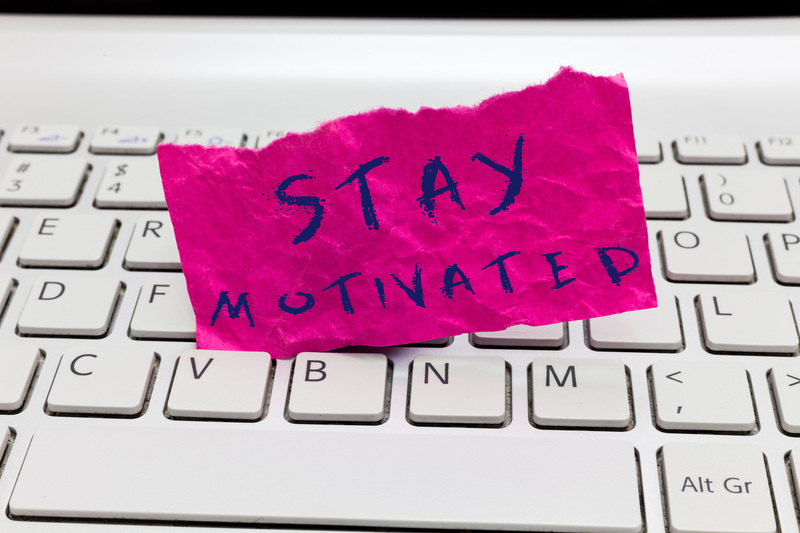 Believe it or not, motivation often comes after starting a new behaviour, not before – contrary to what most people would think. So, the best thing to do to ensure you become motivated, and stay that way, is to embed exercise into your daily routine. By making exercise a habitual part of your day – no different to brushing your teeth or feeding your pets – you’ll start to realise the immense satisfaction that can be gained from it, removing any negative responses you may once have had before you began to prioritise your workouts. No-longer will you see exercise as a chore, similar to putting the bins out once or twice a week! Instead, you’ll view it as a luxury; something to look forward to that enables you to escape from the noise of the outside world, benefitting both your physical and mental well-being. Essentially, it’s a case of “mind over matter.” If you’re able to fight through the first few months when sticking to a routine can be a challenge, you’ll develop a workout positive mindset, find your flow, and feel your motivation rise to new heights! During exercise, endorphins are released from your body; chemicals which can trigger a positive sensation, while reducing your awareness of pain. The way they work is by transmitting electrical signals within your nervous system, mimicking some pain medicines by latching on to the same neuron receptors. But, in contrast to painkillers, which can lead to reliance or addiction, endorphins have no such effect; they truly are a natural pain remedy. Alongside the pain-fighting effect of endorphins, they can also lead to the feeling of euphoria! You may have heard of a “runner’s high” – which many athletes have suggested can be achieved through prolonged periods of exercise. With nothing but you and the open road ahead, running (as just one example of a spirit-lifting sport) can help limit negative thoughts, reduce stress levels and improve appetite, helping you to make healthier and more sensible choices in all aspects of your life. And with all this good feeling floating around, you’ll feel all the more motivated to stick to your routine and reach your goals. From time to time, we all need someone to drag us to the gym when we’re not feeling up to it! By finding a workout partner or gym buddy, you’ll be able to keep each other motivated by sharing words of encouragement and holding each other to account, so that you never miss a workout. That’s the great thing about partnerships – you’re in it together! But don’t panic… If you don’t have a workout partner to immediately call upon, then a brilliant way to exercise with the support of others is to join a group exercise class, where you’ll meet like-minded people with their hearts and minds set on achieving similar goals to your own. What’s more, by surrounding yourself with positive, hard-working people, who are achieving their aims, this will spur you on to do the same. Seeing other people’s commitment and how they’re being rewarded for their efforts can be very inspirational, increasing your motivation and determination to succeed. We challenge you to stick on Eye of The Tiger, made famous by the Rocky boxing movies, and not feel motivated! But even if it’s not to your cup of tea, there must be tracks out there that leave you feeling fired up! Experts at Brunel University in London have been studying the effect of music on exercise for the past two decades, and their findings have shown that everyone from runners in the park, to elite athletes, are using music to gee themselves up and reach the sweet spot, otherwise known as “The Zone.” They also found motivational synchronous music can improve running speed. But it’s not only running where music is being utilised… Legendary American swimmer, Michael Phelps, was infamous for listening to some pretty intense hip-hop in competition arenas, while many professional sports teams have specific tracks that they like to play in the dressing room as part of their pre-match rituals. Whatever your music tastes, perhaps the right playlist is all you need to fuel your exercise? Anyone who’s been to a running event will know that its common to see competitors slurping cups of coffee before a race begins. While this might seem strange, there’s actually a very good reason for it… Research by Coventry University showed that the caffeine from your favourite blend can improve your endurance and motivation by improving your mood and reducing the amount of adenosine in your body – a chemical which makes it more difficult for your muscles exert force, which, in turn, leaves you feel weaker when you exercise. So, the message here is… don’t be afraid to grab yourself a quick Americano before you work out! It’s normal to feel a surge of motivation early in the year (#newyearnewme). But while many of us get caught up with the idea of “hammering it in January,” we need to think longer term; going back to our earlier point about developing an exercise habit. Once you’ve committed to this new lifestyle – where exercise is not an add-on, but instead a concrete part of your normal, everyday activities – you’ll feel more motivated to train and more patient when it comes to reaching your goals. The important point to remember is that even small progress is progress. Good luck! If you’d like an exercise program that will keep you motivated, or a group fitness class to attend where you’ll be surrounded by like-minded people all with the same desires and goals, we’d love to hear from you. Find your 1Life centre here or contact us.